A 72 year old man presents to his primary care physician with a complaint of chronic right knee pain that has gradually worsened over the past few years. the patient denies any significant trauma to his knee. he says that he feels minimal pain in the morning , but the pain gets worse as the day passes. The pain particularly occurs when he stands or walks for a long time. He says that his knee feels stiff but he does not have any episodes of the joint locking or giving way. Sometimes he has felt his knee making grinding sounds when he walks. he has been talking ibuprofen for the pain which does reduce the symptoms to some extent. He denies similar symptoms in other joints. A well appearing man in no distress. The right knee does not appear swollen or erythematous and there is no effusion. He has a dull pain along the tibial-femoral joint line. He has mild deep pain with range of motion that worsens at the extremes of flexion and extension. There is a palpable crepitus during movement. Based on the above history, examination and the x ray findings what is your diagnosis? 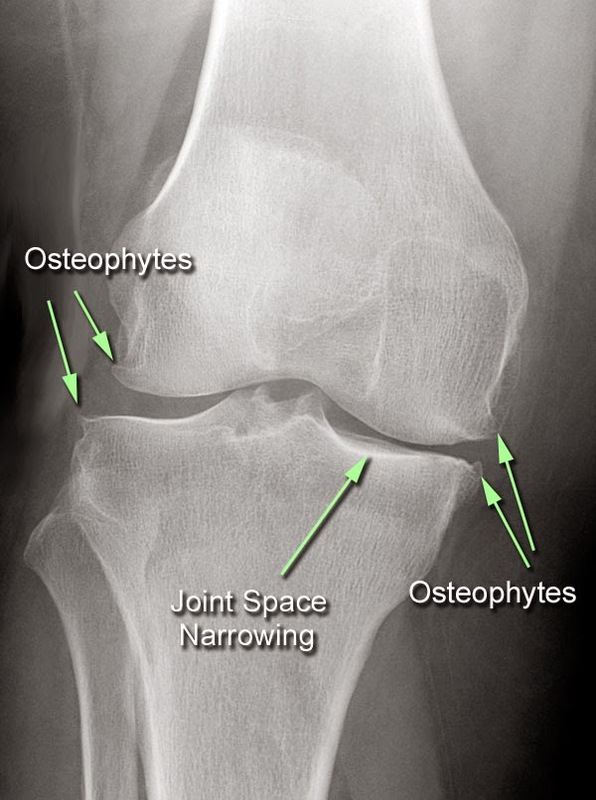 Osteoarthritis is a chronic, degenerative disease of the joints that result through gradual deterioration of the articular cartilage. It can occur in any joint but most commonly occurs in the hips, knees and spine. Insidious onset of joint stiffness and pain that worsens with activity and weight bearing. Decreased and painful range of motion of the affected joint. Bony protuberances in the distal interphalangeal joints (known as Heberden nodes) and proximal interphalangeal joints (known as Bouchard nodes) when the joints of the hand are involved. ESR, C reactive protein, and serum WBC counts are all normal. 1. Activity modification, physical activity and NSAIDs are used as initial treatments. 2. Patients with persistent symptoms or acute exacerbation of joint pain will have an improvement in their symptoms with an intraarticular corticosteroid injection. 3. Total joint replacement is the definitive means of treating significant joint degeneration and has a high success rate of relieving joint pain.